Fox Bite Alarms There are 6 products. With this amazing new technology developed for the ground-breaking N Series of alarms now at our disposal, it was only right to further improve some of our biggest-selling ranges of alarms. The Micron M+ is the first to benefit from a whole host of new features. The Fox Micron MX+ Bite Alarms are fitted with a cone speaker for a super crisp sound that travels further than any other on the bank. Fox Micron Mr+ Alarms This brand new range of Fox Remote Alarms is bound to win fans, as the features on these alarms are awesome for the price. Available in sets of 2, 3, or 4 heads with a receiver, they come in a protective presenta­tion set. Single Mr+ heads are also available separate­ly. 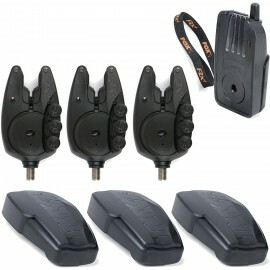 Fox Micron MXr+ Alarms This brand new range of Fox Remote Alarms is bound to win fans, as the features on these alarms are awesome for the price. Available in sets of 2, 3, or 4 all blue heads with a blue receiver, they come in a protective presenta­tion set. Single MXr+ heads are also available separate­ly. Take your pick from three different variants to tailor to the amount of rods you like to have out at once. Each package comes supplied with a receiver and 2, 3 or 4 alarms depending on your choice, all neatly organised into a tidy case for easy storage.